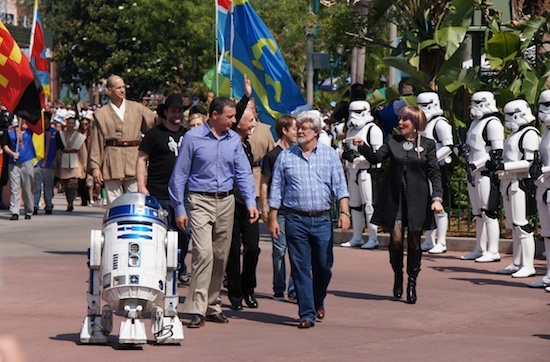 With a cast of hundreds of Star Wars characters and some celebrities, Disney opened the new Star Tours: The Adventures Continue attraction at Disney’s Hollywood Studios with a bang – literally. Read on for our photos and full video of the ceremony. 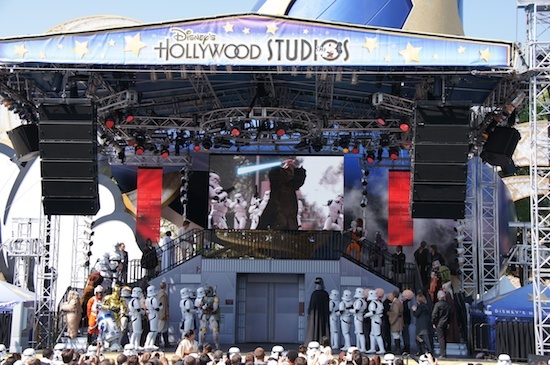 The event started with a parade of characters down Hollywood Boulevard to a large stage set up in front of the icon hat. 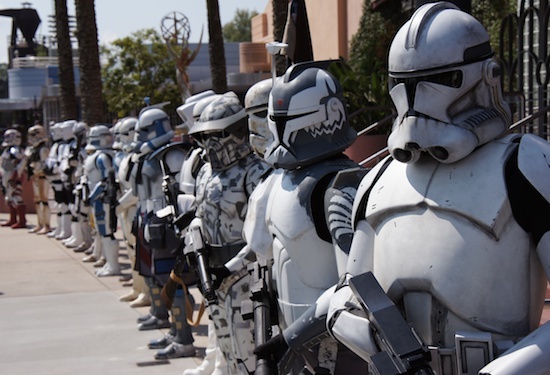 The processional included members of the 501st. 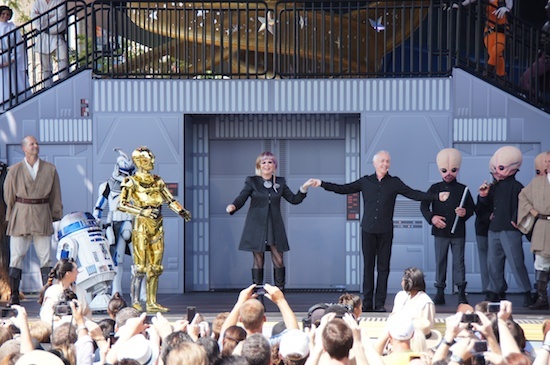 Once onstage, the character host for the event, Bree Starlighter, was joined by Anthony Daniels, who has played C-3PO in all six Star Wars films. 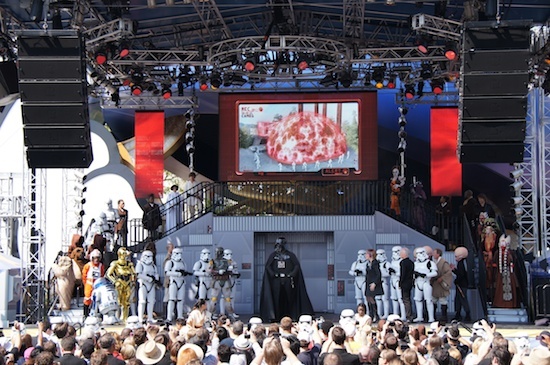 But the fun was short-lived as Darth Vader and his Stormtroopers arrived to put a stop to Star Tours. As you can see in the video screen, the Empire placed a force field over the entire Star Tours building. 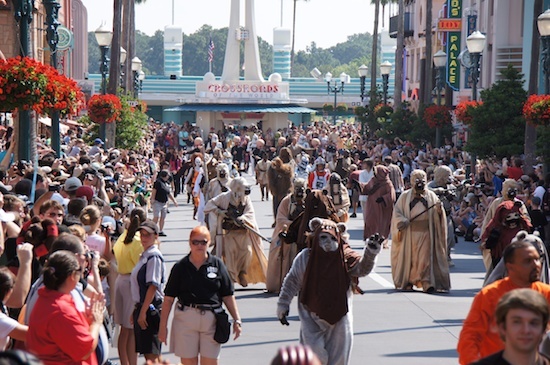 But wait, two hooded Jedi arrived and battled Stormtroopers all the way from Star Tours to the main stage. Whoa! 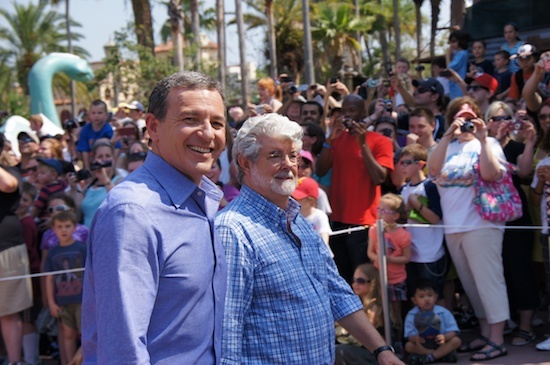 The Jedi dropped their cloaks and revealed themselves as Disney President and CEO Bob Iger (left) and Star Wars creator George Lucas. 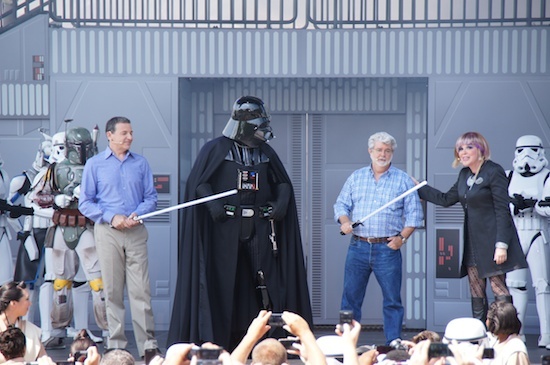 Lord Vader meets his maker. George said that R2-D2 would know what to do. So R2 proceeded to work a switch, which raised an ion cannon. 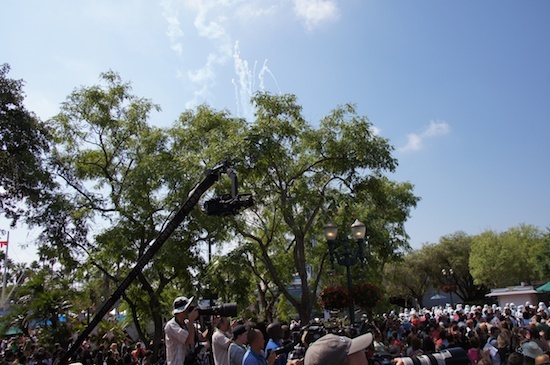 The cannon shot off in the direction of the Star Tours building. 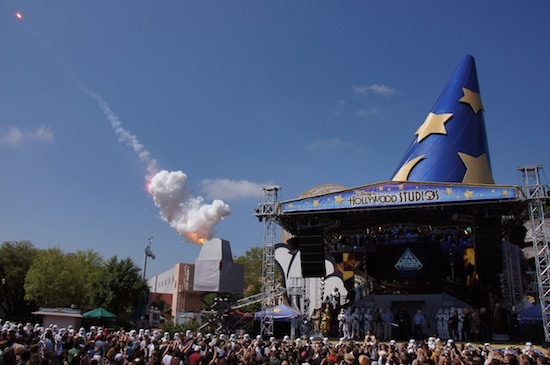 Then an explosion was heard and seen at Star Tours. The force-field had been destroyed. 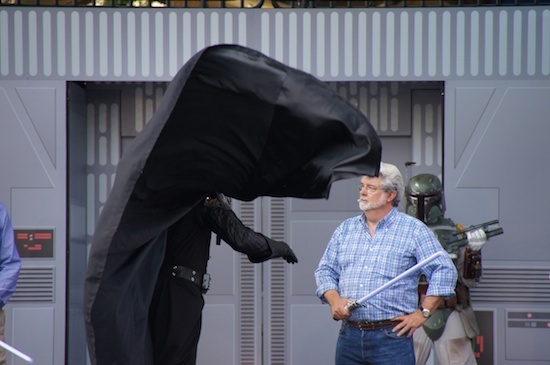 With that, Vader left with a swoop of his cape. 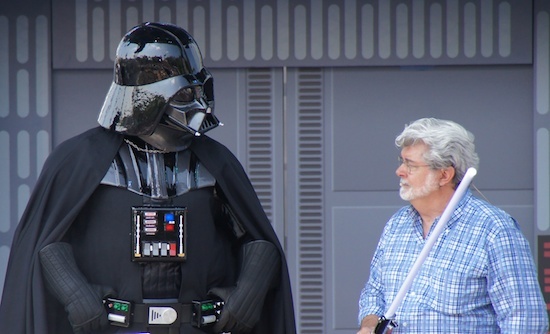 He said he’s headed to California to stop the opening of Star Tours at Disneyland. 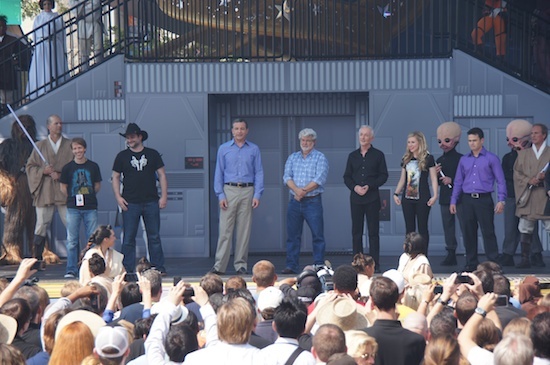 Some other Star Wars celebrities joined George, Bob and Anthony on stage: Dave Filoni (Supervising Director of The Clone Wars), Daniel Logan (Young Boba Fett), James Arnold Taylor (voice of Obi-Wan Kenobi on The Clone Wars) and Ashley Eckstein (voice of Ahsoka Tano on The Clone Wars). 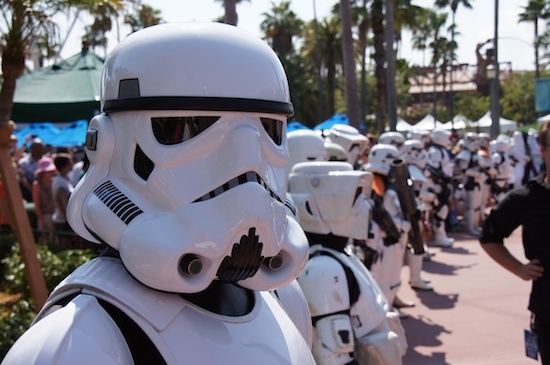 Stormtroopers lined the street leading from the hat to Star Tours, making a path for Bob, George and the others to walk to the attraction for a first official ride. 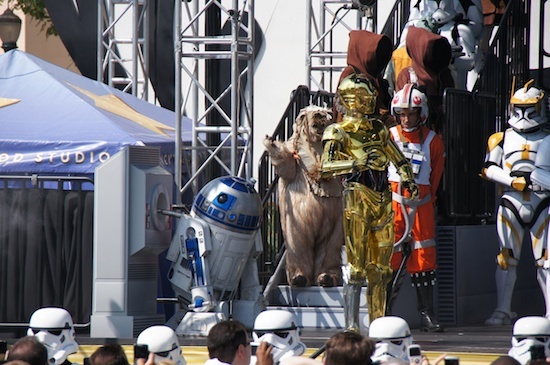 • For more from Star Tours, including interviews and tours: be sure to watch episode 26 and 27 of Orlando Attractions Magazine – The Show.